During January, experience the local version of McCloud while things are quiet. It was always the same question: "But what is there to do?" Too often people assumed that living in a small community translated into limited entertainment options. I say it just depends on what you consider "entertainment". I've never felt limited in my options to keep myself busy and entertained. In fact, I'd say if anything, living here has generated an appreciation for a vast number of opportunities, not the least of which are our annual festivals. I will always remember the anticipation and enthusiasm brimming within me as I awaited the many events that took place in McCloud throughout the summer. It was an annual tradition for my siblings and I to weave in and out of Flea Market vendors, spending our hard-earned allowances on all manner of odds and ends (I particularly remember these foam animals on sticks that one vendor used to sell, and that my sister and I would purchase every year, without fail). And I remember our excitement to dress up in era-appropriate garb for the Civil War Re-Enactment that used to be held on Main Street and in the fields south of town. For someone who has attended McCloud's festivals, year after year, what continues to make them inextricably unique is the way they bring together both the new and the old. So many of the vendors have become long-time favorites, whose return each year is eagerly anticipated. And yet, every year someone new and equally enchanting joins the ranks. Lifelong residents get the chance to catch up with old friends and reconnect over distant memories and a shared history. The first two events of this season were no exception. The 13th Annual Mushroom, Wine, & Music Festival took place this past May 27 & 28th, and people from all over the state, country, and world gathered to celebrate one of our town's most unique natural resources. Spirits were high, laughter was abundant, and there was just an overwhelming sense of support and camaraderie amongst attendees, as well as event contributors. Foraging for mushrooms in the forests outside of town is a long-cherished tradition of McCloud residents, and it is a joy and pleasure to have the opportunity to share that with newcomers and tourists alike! This year's event even included a Gourmet Mushroom Dinner, a five-course benefit dinner crafted by five renowned chefs, and served at the McCloud Hotel. 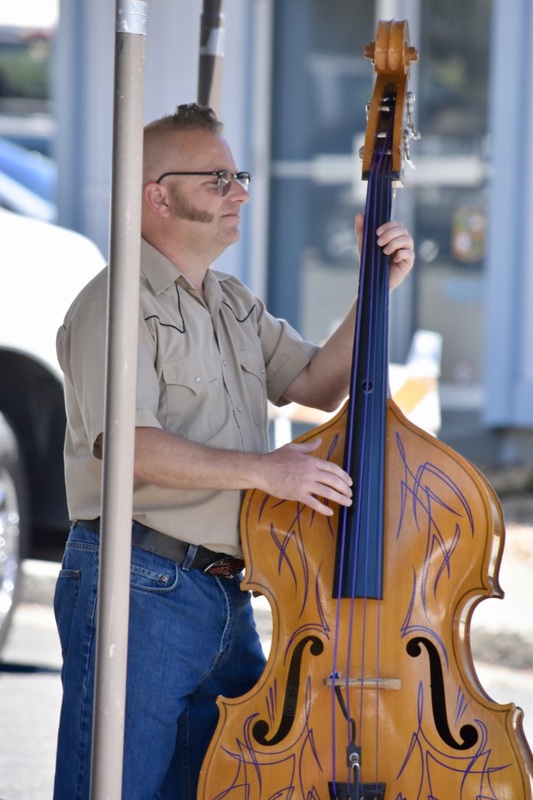 The 46th Annual Flea Market began early on Sunday, June 4th, as cars started lining the streets downtown and eager bargain-hunters made their way through vendors to get first-pick at the multitude of antiques, crafts, and re-purposed relics. Music provided by Wild Woman Sounds kept festival-goers' spirits high and the atmosphere relaxed. Halfway down the street, the aroma of delicious street foods was enough to stop anyone in their tracks. And of course, the McCloud River Mercantile offered a break from the afternoon heat while still providing ample opportunities to shop and refuel in any one of the building's businesses: Shasta Reflections, Kyody Coffee, The Candy Shoppe, The Mercantile Store, and White Mountain Cafe. 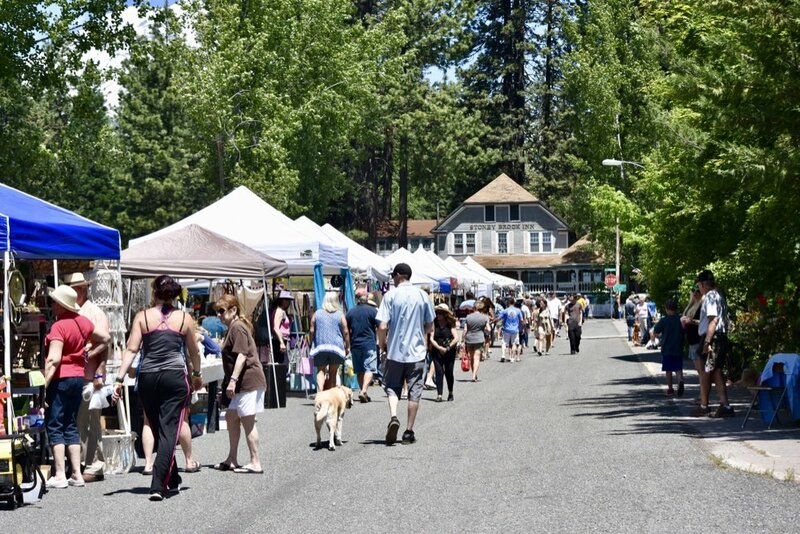 As the years go by and the town keeps growing and changing, one thing is certain: McCloud's annual festivals will always have something to enthrall the hearts of attendees both young and old, local and visiting. "YOU know what mushroom hunting is!!!?" I'll never forget the day, in my second year of college, that these words escaped my roommates mouth. Because up to that very moment, it had never occurred to me that there was a vast world of people out there who didn't know what mushroom hunting was. For as long as I can remember, walking the forests just outside town, stooped over with squinted eyes, has been an annual summer tradition. I'll always be able to envision, clear as day, my great-Uncle Emilio and my grandmother, the quintessential little Italian lady, prodding at mounds of pine needles with their walking sticks, hoping to uncover the coveted boleta. And I'll never shake that frantic excitement, characteristic of the kid in the candy store, as I watch my father adorning venison steaks with morels, freshly sautéed in butter and garlic. But what gets me the most is the sheer exhilaration that almost consumes me as I discover the first mushroom of the season. From that moment on, every time I close my eyes, even if only for a second, all I see are glimpses of mushrooms. And it becomes a challenge almost, to discover whether I can find as many or more than the year before. As life unfolds and the years go by, responsibilities change, and the freedoms we once enjoyed may no longer hold the same weight or priority in my day to day lives. But one thing is for certain: as a born-and-raised McCloudian, mushrooming is embedded in my soul, and will remain a timeless tradition for myself and my family every year to come. They are out there, everybody. Let's get them! Come and see for yourself what spring hiking in McCloud has to offer! Spring is here! Spring is here! And, we are gearing up for a FULL season of festivals, music and events. Every year, the streets of McCloud are packed from May to October with visitors from all over the globe. It's true! Last year, our furthest visitor came all the way from Japan to experience small town life in McCloud. And, every year more and more fall in love with what many consider Northern California's answer to the perfect weekend getaway. Historic inns, fresh homemade goods, and waves from passersby make this a truly unique experience. For a full list of McCloud Events and Festivals, visit the McCloud Events and mark your calendar for a season full of family, friends, music and all that our town has to offer. You couldn't ask for a more perfect intersection of fresh powder, longer days and perfectly groomed hills than Mount Shasta Ski Park in the spring. Fortunately for you, McCloud is located just 10 minutes from this amazing ski experience. Start your morning at White Mountain Cafe for one of Scott and Aubrey's special omelettes or at Kyody Coffee for a homemade pastry and mocha to go. Once you're fueled up, you're ready to head up the mountain to enjoy a day of skiing or snowboarding on Mount Shasta's south side. Relax and enjoy a relaxing evening at one of our many historic hotels including McCloud Hotel, McCloud River Mercantile Hotel and McCloud River Inn. A restful stay guarantees that you'll be ready to tackle the slopes one more time, rounding out a perfect weekend escape that continues to draw you back again and again. Come and experience our town of McCloud and Mount Shasta Ski Park to see for yourself why we are Northern California's number one choice for that perfect combination of outdoor adventure and small town hospitality. With all this new snow, what is McCloud to do? Well, McCloud Outdoors and McCloud Millworks have partnered up to bring Snowshoe McCloud Historic Guided Tours to the old mill property. They will be kicking off their new endeavour Saturday, January 28th at 1PM for a 2-3 hour guided tour complete with a history lesson along the way. For only $55 you get a snowshoe rental, hot drinks, cookies, and a guided tour along a groomed trail with Mount Shasta as your backdrop. McCloud Offers several ways to ring in the new year. From fine dining and live music at the McCloud Hotel to dancing the night away at the Shasta View Lodge or the American Legion. This week, OnlyInYourState.com announced their Top 12 Awesome Diners in Northern California. And, of course, McCloud's own White Mountain Cafe was Number 1! With husband and wife team Scott Remley and Aubrey Hagberg at the helm, there was never any doubt. Scott is the man behind the stove when it comes to recipes, cooking and pleasing the palette's of his customers. Aubrey in the quintessential beauty plus personality that greets her customers with a smile and a "Go ahead and sit anywhere" just-like-at-home attitude. Bring your dressed up dogs, stick ponies, bikes and humans over the hill for McCloud's 10th Annual Dog, Pony and Bike Parade Friday, November 26th. Registration for the Main Street parade begins at 10AM with the festivities rolling out at 12PM. Don't have a bike? Then hop in your vintage ride and be a part of the show! McCloud made the top of the list in the recent article by OnlyInYourState.com titled "15 Small Towns In Northern California That Offer Nothing But Peace And Quiet". We love seeing our name in print especially when it's at the top of the list. Welcome to the 5th Annual Biketoberfest! Grab your bikes and head north for the 5th annual Biketoberfest Saturday, September 24th starting at 7:30AM in beautiful McCloud. Looking for some inspiration? Check out our new video with highlights from last year's event. Join us for a day of rides and brew, music and food! McCloud is proud to support its local museum and the people that help keep our history alive. Next time you're in town, come on by and learn why McCloud remains a strong, close, and hardworking community. 7th Annual McCloud Fireman's Muster is this weekend! Join in the fun June 11th! Festivities kick-off at 11AM with a parade down Main Street and muster events beginning immediately after at Hoo Hoo Park. Kyody Coffee is now a chain! On Friday, May 6th, Charlie and Cindy Miller cut the yellow ribbon to officially open the second Kyody Coffee and Cafe in the Mercantile building on Main Street. This years' Mushroom Festival features many local favorites starting Saturday, May 28th with McCloud Elementary School's own Taiko Drum class leading us in at the 11AM Opening Ceremonies. Did you know that McCloud and Mount Shasta were the filming locations of the movie "Climb An Angry Mountain"? Starring Fess Parker, the movie was released in 1972. Just another little piece of McCloud history. Rene Agredano, Demand Media - McCloud is a rustic alpine community with a colorful past as a prosperous lumber town. Situated in the shadow of Mount Shasta at 3,200 feet above sea level and surrounded by over 1 million acres of national forest lands, today McCloud is no longer a hub of commercial logging activity; instead, its bustling downtown area serves as a year-round base camp for anglers, hikers, hunters, campers and off-road enthusiasts.